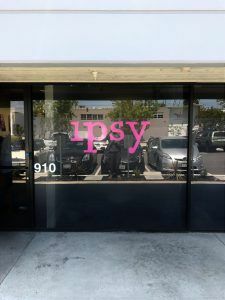 We started doing work for ipsy a few years back when they needed a window graphic to display their logo. Since then, we’ve done many different jobs for them like banners, posters, and wayfinding signs for events. Ipsy is a company created by Michelle Phan, a well-known makeup artist, that offers a subscription program for beauty products that consumers can receive on a monthly basis. They hold many events and we’re glad to be their first choice for their signage needs. They opened a new location in Santa Monica this year so they reached out to us to recreate the same window graphic we made for them when we first started working with them. We already had the existing artwork so it was very easy to make exactly what they were looking for. 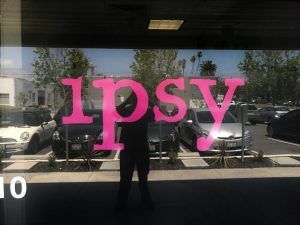 Ipsy’s logo color was digitally printed onto vinyl and cut our using our plotter. As long as we have a Pantone color, we can digitally print whatever color you need for your prints, graphics, etc. Our plotter can get all of the details of the outline of the logo perfectly to make sure that it matches how the logo is presented in all of their other marketing. Whether you are looking to cover the entirety of your windows with perforated window vinyl, or if you want some cut vinyl graphics, using your window space to advertise is a great idea for any business. Displaying your logo not only helps with brand recognition, it helps customers find your location. Many businesses will also display their hours and services with cut vinyl lettering which looks a lot nicer than the typical hours sign that you fill in and hang on your door. You can also use the space to advertise specific products. As long as you have print-ready artwork, we can create high-quality digital prints of anything you want to display, whether it is to advertise specific dishes at a restaurant, or a specific brand of pet food at a pet store. We can also plot any font you want to use if you want to make sure that the lettering looks good with any existing window signs or if you want it to match your company logo. Vinyl graphics are versatile, customizable, and can be applied to any flat surface. For outdoor vinyl graphics, we laminate them to ensure longevity and we can come install them to make sure that the positioning looks good.